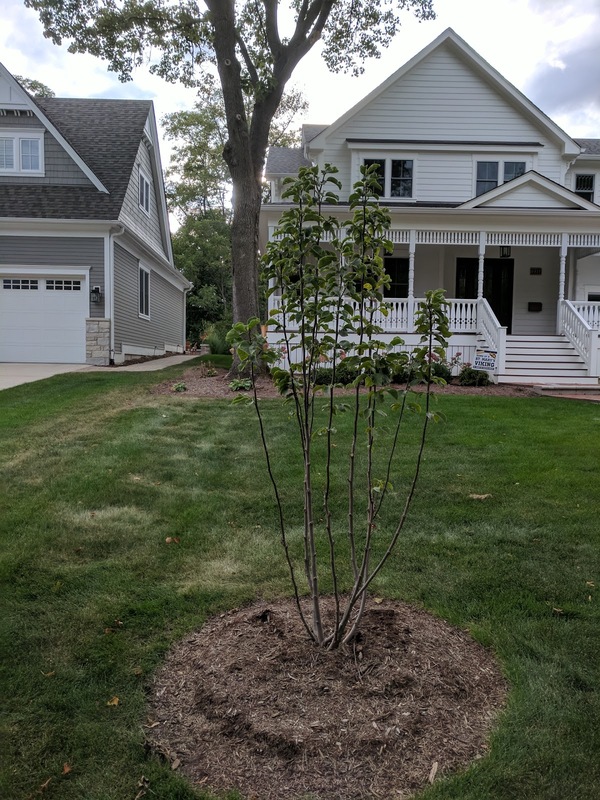 Just over a five weeks ago, I posted the first photo of our new/young Saucer Magnolia tree in the front yard of our #NewOldFarmhouse after I had 'limbed it up' for the first time. It had grown a bit since being installed in June and the pruning I gave it will hopefully fuel its upward trajectory. Above you'll see a photo I took this past week after I gave it another minor pruning where I continued to 'limb up' the main leaders. I took off a few suckers and removed leaves and shoots that were coming off low on the main branches. Flipping back and forth between the early August post and this photo tells me the late summer growth is hard to detect in terms of size, but is noticeable in the buds being created. The leaves - in some places - have become discolored - which has me worried, but I'll post a closeup of it on the blog and show off the newly emerging buds, too. I have big hopes that this tree will grow up - with our family - and be a meaningful part of our front yard for years to come.